Did the Vikings have ice cream? Perhaps not, but they certainly could have had it on Iceland – using Skyr! Read on and follow our frozen journey back to the ancient origins of this surprisingly healthy Viking-equivalent (kind of) to Greek yoghurt . 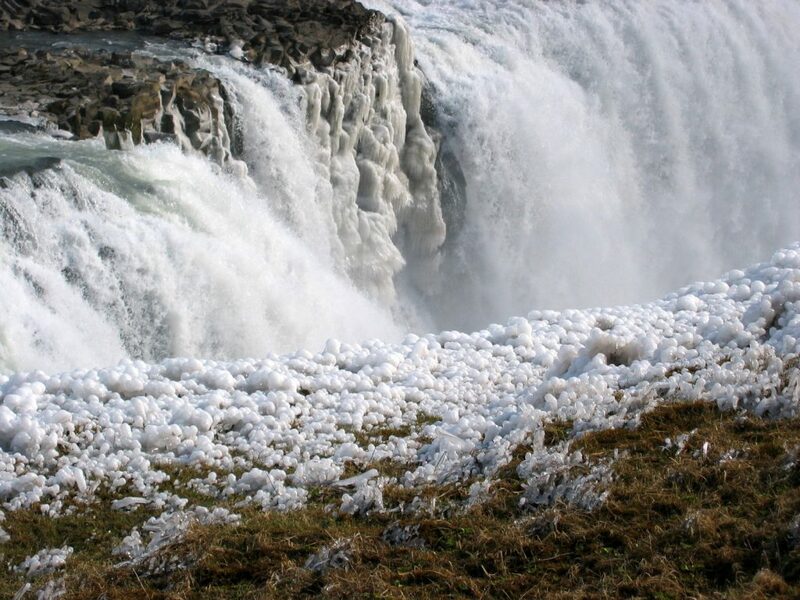 Iceland – a fascinating island-country filled with enchanting nature, glaciers and hot springs, where ancient Viking lore and cultural traditions still are very much present. Skyr [pronounced “skee-er”] is actually a kind of fresh cheese but is mostly referred to as a yoghurt. 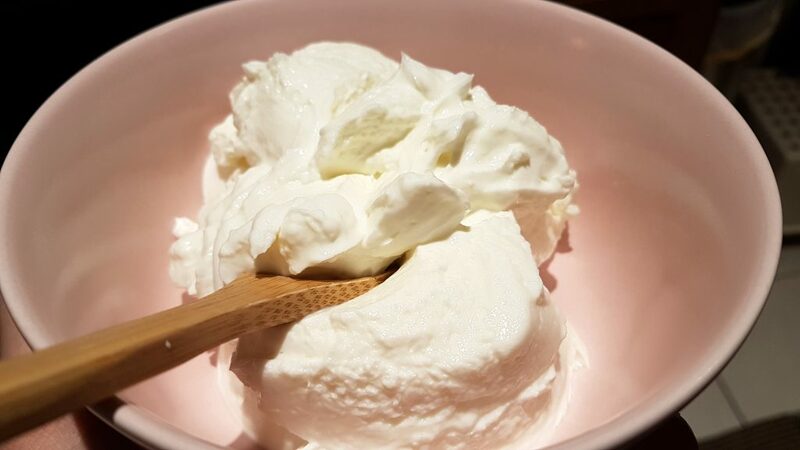 It is easy to understand why – Skyr looks pretty much like thick, strained Greek-style yoghurt and the taste is refreshing and yoghurty-tart. Since it is made with skimmed milk, it is very low on both fat and sugar. As it also comes loaded with protein and calcium, it is no wonder why it has become such a popular thing among healthy-minded yoghurt lovers. But can you find Skyr outside of Iceland? Well, it certainly might not be the easiest thing to find in your local store. You could try to make it yourself, but for best results you should ideally get hold of some Skyr to use as your initial “founding culture”. Which unfortunately brings us back to square one and is cold comfort for those unable to find and buy any Skyr where they live. As a last desperate courageous resort, attempt to create your own Skyr from scratch the old ancient Viking way! Get hold of skimmed milk and all the other ingredients (except for the missing Skyr, of course), then prepare a bowl of scalded milk etcetera and place it someplace outside where you live (preferably in some non-polluted area). Then hope that a suitable “live culture” will form naturally in your bowl and proceed further on this basis. This, I have read, was basically how the old Vikings did when they ran out of Skyr and needed to make themselves some more. Some would even prepare several smaller bowls with milk and place them in different areas and settings, searching and testing for the most optimal surroundings for the creation of an optimal Skyr culture. Skyr blueberry ice cream … mmm! Traditionally, I have been told that the main Skyr flavours on Iceland were blueberries or rhubarb: “the only things growing on Iceland”, according to a good friend of mine with Icelandic blood in her veins. While Skyr these days comes in many different flavours, I decided in favour of the classics – in this case blueberries! You may se fresh blueberries (or even other flavours, of course), but for this recipe, a good quality blueberry jam will actually do perfectly! The jam will provide all the sugar we need, so there is no need to add any extra (unless your sweet tooth demands it, or you want to improve scoopability after freezing the “sugary way”). The only other ingredient is some cream: the Skyr is so low in fat in itself that we to add at least some extra fat to improve on the general consistency. Note however, that the relatively low amounts of sugar and cream will cause the ice cream to freeze quite hard if left in the freezer. To improve the scoopability, prepare for a reasonably long thawing time before serving (or do as I often do, and cautiously use the micro-wave oven for some subtle thawing), enjoy the ice cream fresh after the churning (my personally preferred option!) or increase the proportion of sugar and/or cream in the recipe. 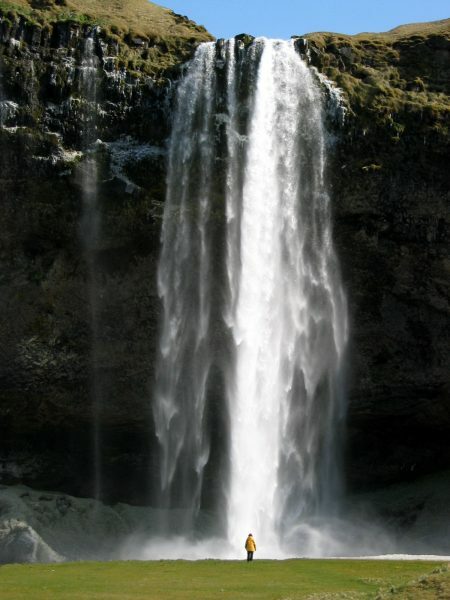 Perhaps the beautiful Icelandic nature encouraged the vikings to take some time off from the pillaging, blood feuding and fighting and instead peacefully carve some runes, tell a saga or two and enjoy a delicious bowl of locally produced Skyr? While I typically favour using fresh fruits, good quality fruit jams can be very useful when making ice creams – and not only when jam is the only available option. 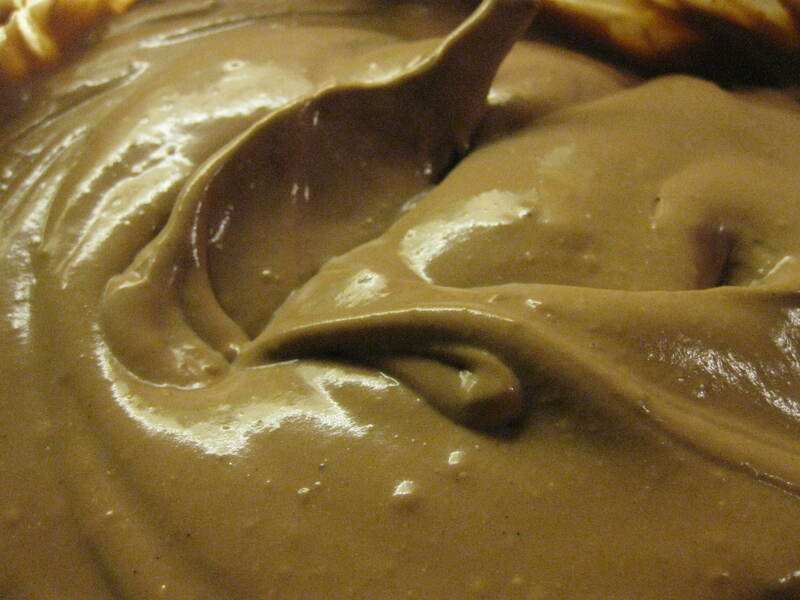 Many ice cream recipes call for fruits to be puréed with sugar, and in some cases also suggests that the purée be cooked. As fruit jams/whole-fruit jams basically are fruits stewed in sugar, we are actually already pretty close here. 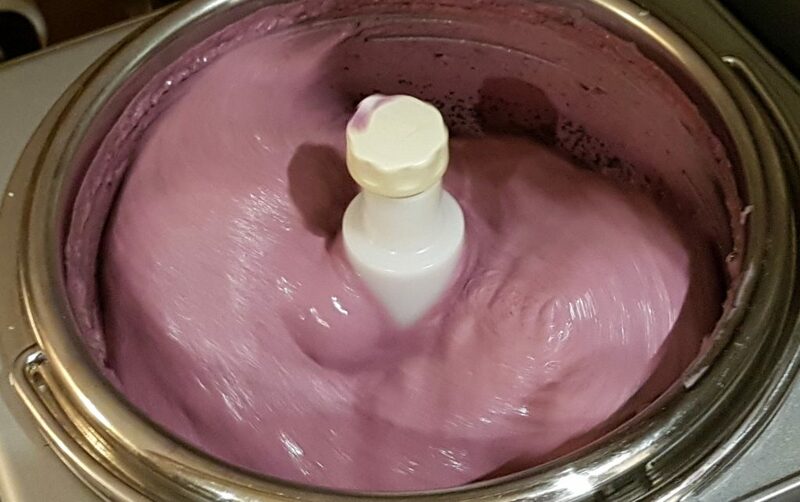 The cooking involved in jam-making will, in many cases, bring out the fruit flavours even more and also reduce the overall amount of liquid (generally a good thing when making ice creams). 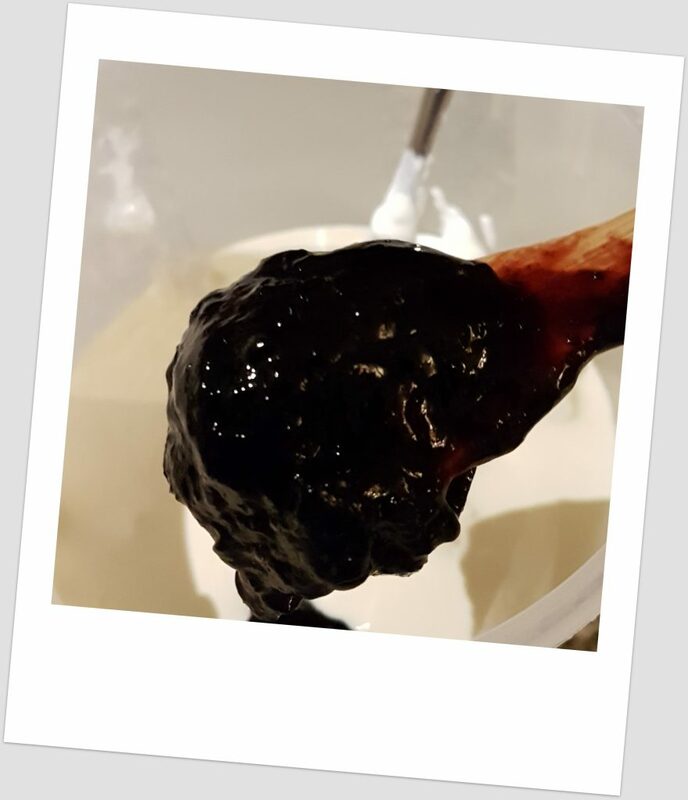 Another useful thing is that jams typically also contain (more or less) pectin, a plant-based stabiliser functionally similar to gelatin and one of the main reasons behind the consistency of most jams. Jams tend to bring a somewhat “cooked” fruit flavour, rather than that of “fresh fruits”. 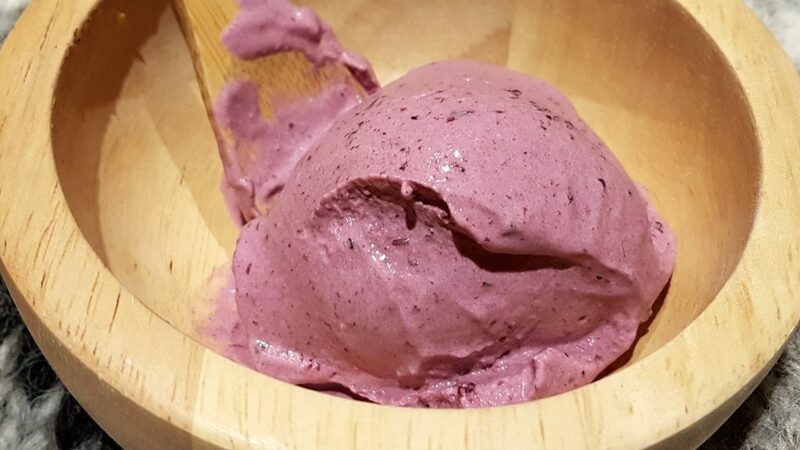 Depending on personal preferences and particular ice cream flavour, some people might well prefer this “jammed fruit” flavour, while others will miss the freshness of un-cooked fruits. This also depends on the particular fruits involved – few, if any people would enjoy fresh, un-cooked rhubarb in ice cream. Strawberries, however, might be a totally different matter. Jams already contain a substantial amount of sugar. You would need to take account of this when measuring how much of your jam actually consists of fruit, and also when deciding on how much (or little) extra sugar you should add for the ice cream base itself. As a general rule of thumb when choosing jams for ice creams – go for good quality jams with high fruit content (at least > 50 %, and preferably even more), and as little other addititives as possible except for sugar and some pectin. Pectin, a vegetable gelling agent often used for jamming purposes, will typically help to improve the overall consistency of the ice cream (those of you who tend to be cautious about adding stabilisers should consider that many fruits and berries contain quite a lot of natural pectin – blueberries being a prime example). This recipe could hardly be simpler – take the Skyr, the cream and the jam and mix it all together. 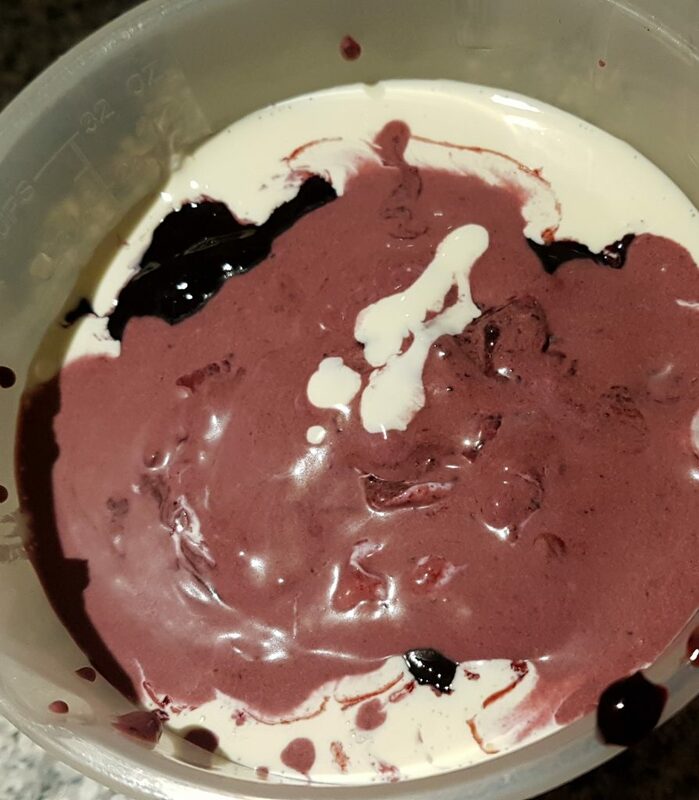 Let’s see – blueberry jam, Skyr and cream: all ingredients we need about to be mixed. As stated, the relative lack of sugar and fat will cause the ice cream to freeze hard when left in your freezer. But enjoying it fresh from the churning is a treat likely to make even an old viking break out in tears of joy and praise the old gods (or “White Christ”, if our ice cream-loving viking already had converted to Christianity). 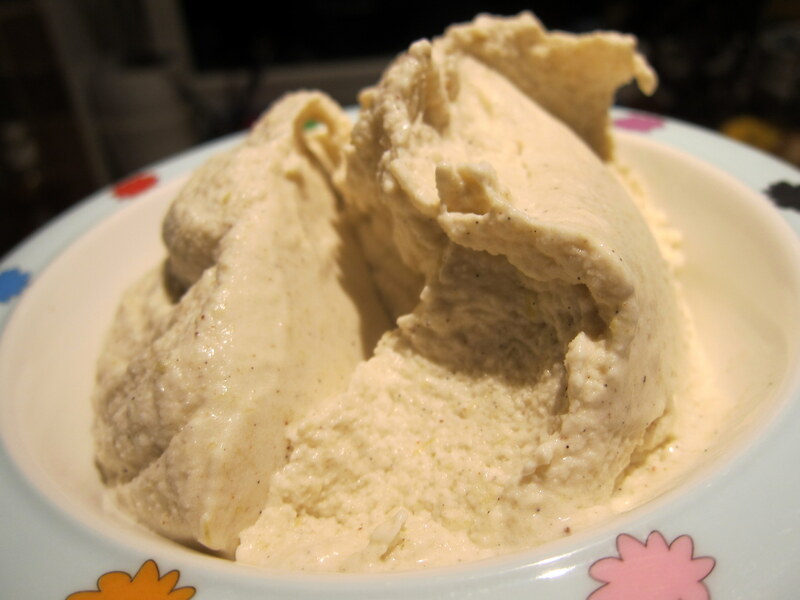 I was so very pleased when I savoured the first batch of my freshly churned Skyr ice cream! 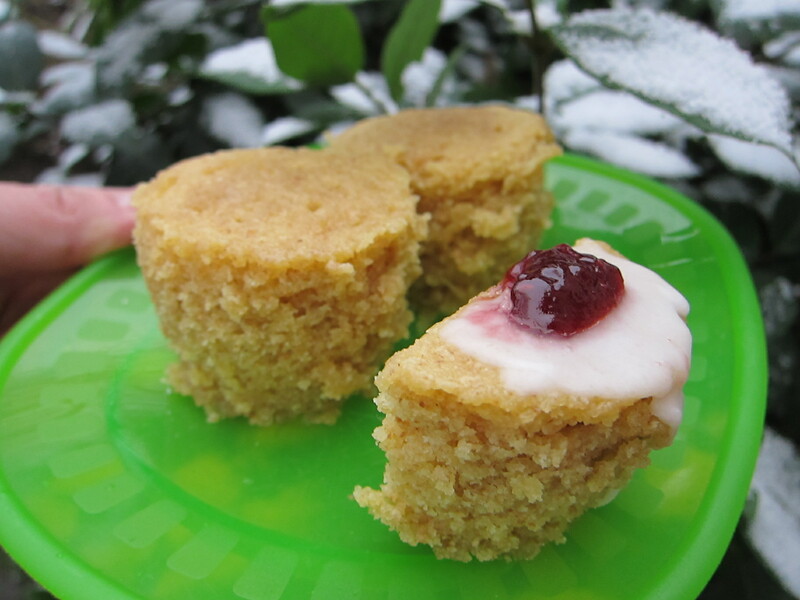 The consistency and texture was rich, smooth and pleasant, and the jam was a perfect flavour match. The delicious wild blueberry jam appeared to have been made specifically for this happy union with the pleasantly tart, yoghurty Skyr. “Wholesome” might not be the first word that comes to mind when talking about ice cream, but the Skyr ice cream really felt wholesome-good! Yes, I was actually a bit surprised as I had feared that the low amounts of fat and sugar could have made the frozen treat less endearing. How wrong I was! The whole family gave thumbs-up, commenting on how tasty the Skyr ice cream was. And yes, it will freeze hard if left in your freezer so if you don’t eat it straight after the churning, count on some thawing. So, in short: get hold of some Skyr and blueberry jam and enjoy a real viking heritage ice cream. And while you sit there and savour the Skyr ice cream, consider the possibility that some inventive viking long, long ago actually might have done the same! Sure, they did not have any ice cream machines or freezers but the snowy and ice-cold Scandinavian winters would probably have provided all the freezing power required for still-freezing. Imagine that – a viking mid-winter ice cream party! Skyr - the Icelandic contribution to the fresh cheese/yoghurt limb of the dairy tree - provides a nice and wholesome basis for a delicious wild blueberry ice cream! Mix all ingredients well, ending with the fruit jam. 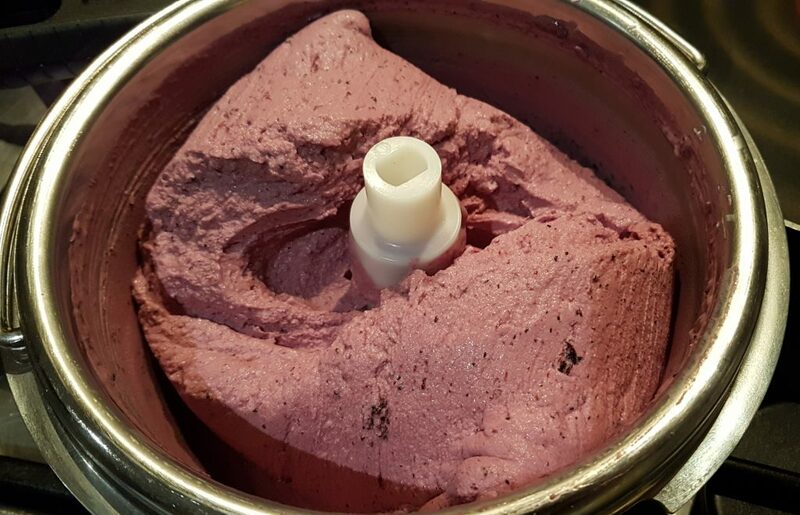 Churn in your ice cream machine, or still-freeze using your freezer (see the post on how to make ice cream without an ice cream machine for good advise on how). Enjoy straight away, or store in a freezer-safe container, covered with plastic film and a lid. Skyr is naturally very low in both fat and sugar. While this makes for a relatively wholesome ice cream, the drawback is that this ice cream will freeze quite hard if left in the freezer. For best results - enjoy freshly churned, or prepare for some thawing! 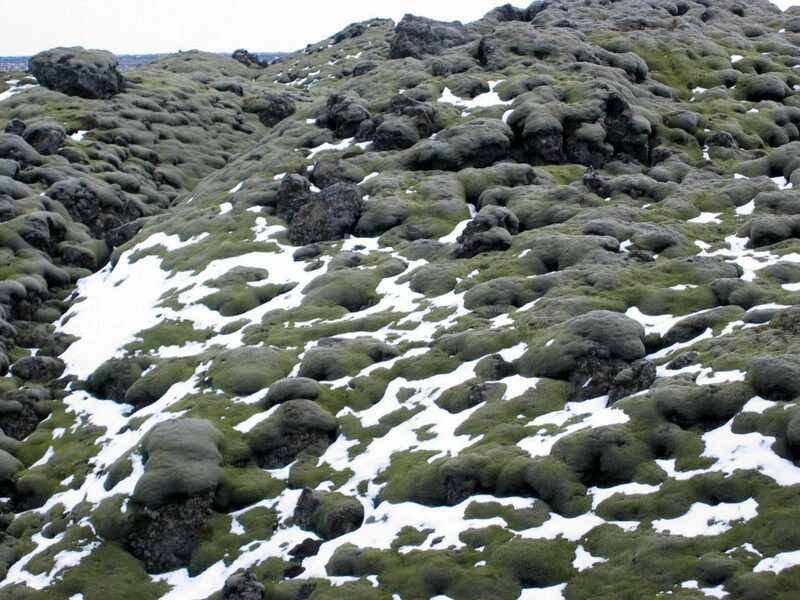 Iceland – with all that snow, perhaps someone actually did manage to make some Skyr ice cream during the Viking age? In search of “smooth” (III) – a winner!